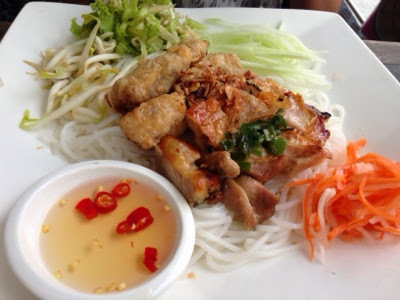 Back in New Zealand; one of the cuisines that featured on our favourites list, was Vietnamese. Without fail, it was a weekly pilgrimage to our fave local to partake in the wonders of Fish Sauce (Nuoc mam), fresh ingredients and fragrant broths. When we arrived in Singapore; it became difficult to find a good Vietnamese place so when we came across Little Saigon, we decided to give it a go. A quick check on The Entertainer app also revealed that the mains were 1 for 1, and so the decision was made. It's been awesome having the Entertainer App to bring about some savings. 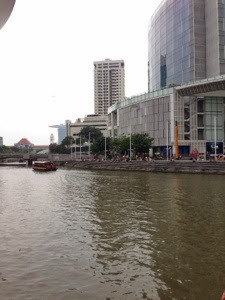 Little Saigon is located at Clarke Quay, right alongside the Singapore River around Block E. For those who are familiar with it; it's close to where the Turkish Ice Cream Man is. 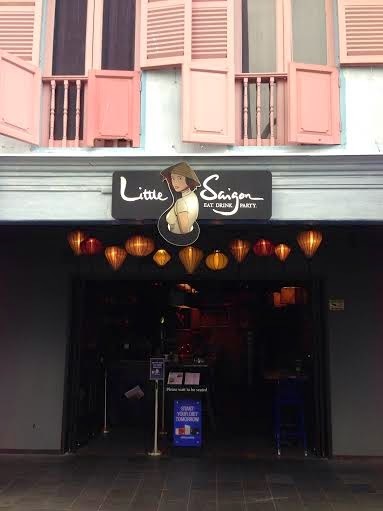 You can also recognise Little Saigon with the Lanterns hanging around the Restaurant. There is both indoor and outdoor dining. We ordered drinks first (priorities) as it was 50% off Beers and Cocktails from opening until 8pm; then it was onto ordering our appetisers and mains. Appetisers were an easy choice. 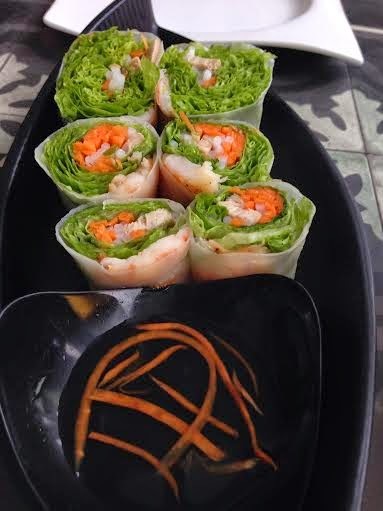 We ordered the Rice Paper Wraps and the Vietnamese Spring Rolls; must have classics. The Wraps had fresh ingredients in them. The Lettuce was a nice green and had a good crispiness to it. It went well with the sweetness of the shredded Carrot. The Pork and Prawn was also good but there wasn't enough in the Wrap. It just needed a few more pieces. The good thing about the Wraps was that they weren't cold to touch, which means they're probably made fresh as opposed to being made the night before and being refrigerated. The Vietnamese Spring Rolls were pretty good as well. The Pork and Mushroom filling was tasty and it was so pleasing to see the Spring Roll skin was actually Rice Paper as well. This is the way it is meant to be done, so a big thumbs up. A shame that some were over fried so the Rice Paper skin had actually split. This meant that the oil got through to the filling and over cooked the Pork and Mushroom a bit. The appetisers were served with Fish Sauce; Nuoc mam. This sauce is the pillar of Vietnamese food; it has to be made perfectly to enhance the flavours of the dishes. Unfortunately Little Saigon falls short here and the Nuoc mam was pretty tasteless and appeared to be watered down. It really needed some fresh Chillies as well to lift it and provide flavour. This is an area they need to work on. For the mains we got a Rice dish and Rice Noodle Vermicelli dish. The Rice Noodle was served with grilled Chicken, fried Spring Roll and raw Vegetables. It is served dry and Nuoc mam is mixed in before eating it. The Nuoc mam had Chillies in it this time but it still lacked taste. The Chicken was moist but wasn't grilled fresh, and so it was cold. Not sure if this is the way it's meant to be but we prefer our Chicken hot. This dish was okay. 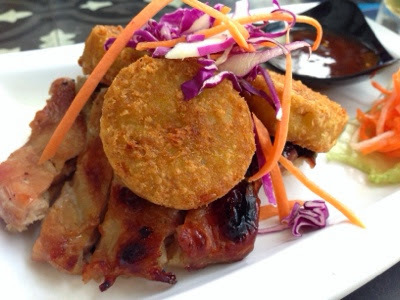 The Rice dish consisted of roasted Chicken and some Sticky Rice Hash Cakes. This was served with Chilli Sauce and came with a bowl of plain white Rice. The roasted Chicken was okay and was served cold. Again not sure if it was meant to be served this way. It also had whole Pepper Corns all over it so you had to be careful not to bite into them and get a hot surprise. We ended up finding them and removing them before eating the Chicken. The Sticky Rice Hash Cakes tasted quite nice. They were soft and it was enjoyable to have it crispy on the outside and soft in the center. Overall; Little Saigon is in a great location along the Singapore River, but still needs to work on their menu to make it more Vietnamese. The dishes we ordered were probably the closest things to Vietnamese food whereas other items were things like stir fried Beef served with Fries? This made the menu and cuisine theme very confusing. It's a small menu so we think that over time, Little Saigon should be able to improve on the quality and taste of their offerings. There really needs to be more Vietnamese food choices though. The Nuoc mam would be an amazing thing for them to perfect. In the mean time; we'll continue our search for other Vietnamese Restaurants to try. 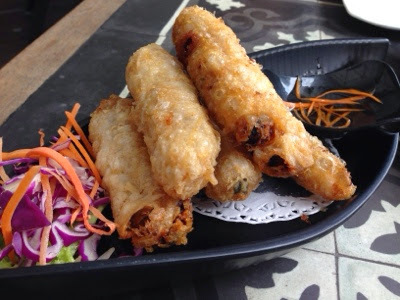 Do you have a fave Vietnamese place you go to?